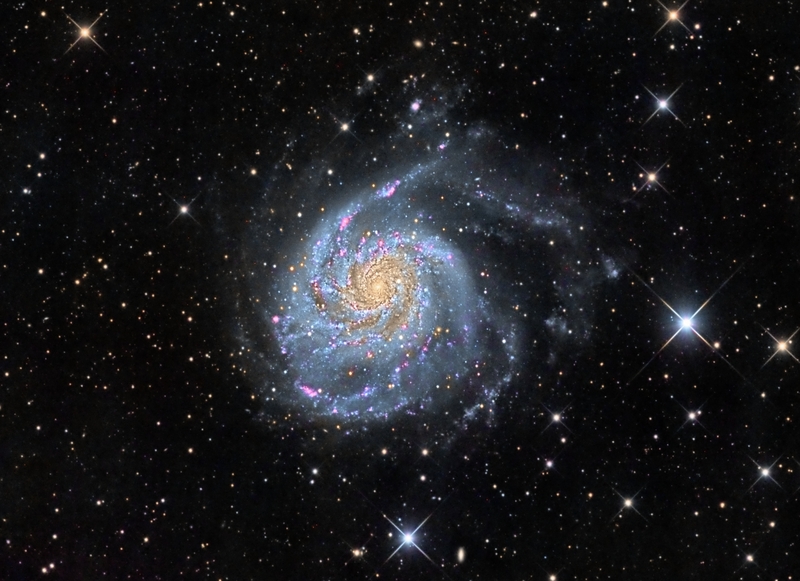 This galaxy is the 101st entry in Messier’s catalogue, M101, but is commonly referred to as the Pinwheel Galaxy. It is close to the handle of the Big Dipper. I have always found this a particularly difficult target to image well. As a result, I spent nearly three months in 2014 capturing more than 41 hours of data for this image! That makes it my deepest exposure ever. M101 is large — much bigger than our own Milky Way galaxy — and relatively close (22 million light years or so). The asymmetry in M101 is thought to be due to a near-collision with another galaxy a long time ago. This probably triggered extensive star formation, showing up as bright blue clusters within the spiral arms. The pink structures are nebulae, similar to the Orion nebula in our own Milky Way galaxy. 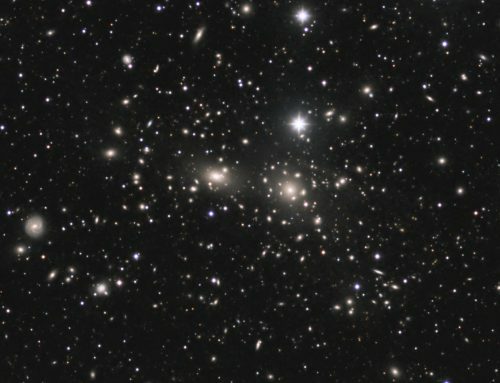 Dozens of other galaxies that lie far in the background are spread throughout this image. 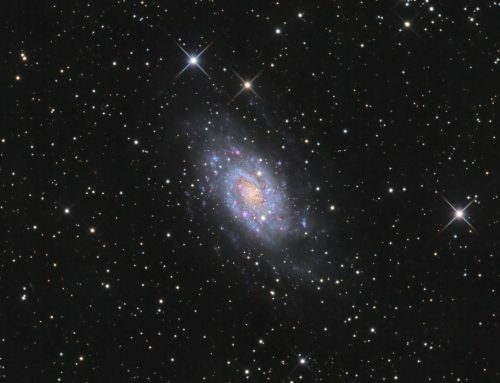 SBIG STL-11000M camera, Baader Ha and LRGB filters, 10″ f/6.8 ASA astrograph, Paramount MX. Guided with STL-11000’s remote guide head and 80 mm f/6 Stellar-Vue refractor. Acquistion, guiding, and calibrationand using Maxim-DL. Image registration, integration and processing in PixInsight. Shot from my SkyShed in Guelph, Ontario. No to little moon for luminance shots gibbous to full moon for colour and HA shots. Average transparency and good seeing for luminance; average transparency and poor seeing for colour shots. Acquired over about 15 nights in 2014. Stretching: HistogramTransformation was applied to make a bright, pleasing image. Creation and cleanup of SynthL: The cleaned up Ha, L, R, G and B masters were combined using the ImageIntegration tool (average, additive with scaling, noise evaluation, iterative K-sigma / biweight midvariance, no pixel rejection). Deconvolution: A star mask was made to use as a local deringing support. A copy of the image was stretched to use as a range mask. Deconvolution was applied (80 iterations, regularized Richardson-Lucy, external PSF made using DynamicPSF tool with about 25 stars). Linear Noise Reduction: MultiscaleLinearTransform was used to reduce noise. Layer settings for threshold and strength: Layer 1: 3.0, 0.75 Layer 2: 2.0, 0.65 Layer 3: 1.0, 0.52 Layer 4: 0.5, 0.25 and Layer 5: 0.5, 0.13. The processed SynthL was applied to the NB-RGB image using ChannelCombination in Lab mode with default settings. 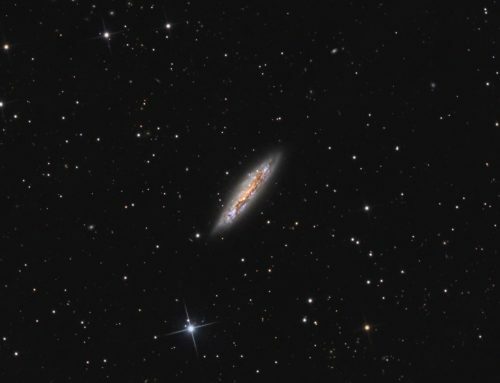 Contrast Enhancement: HDRMultscaleTransform (scale 6, median) followed by LocalHistogramEqualization scales (scale 50, strength 0.5, max contrast 2; scale 150, strength 0.25, max contrast 1.5) were applied to the bright portions of the galaxy. ExponentialTransformation was used to boost the fainter outer arms of the galaxy. 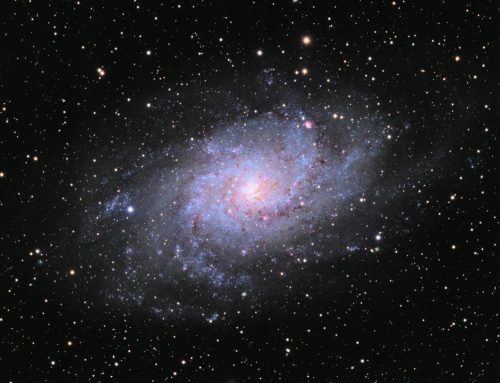 Sharpening: The bright parts of the galaxy were sharpened using MultiscaleLinearTransform followed by UnsharpMask. 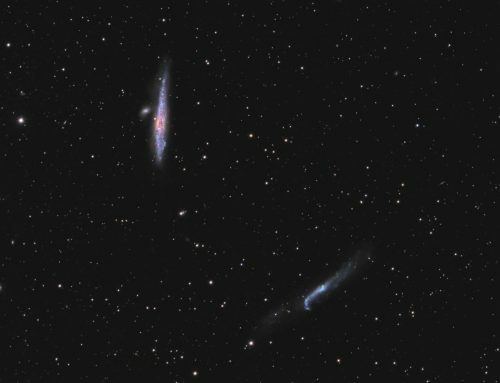 Final Steps: Background, galaxy and star brightness, contrast and saturation were adjusted in several iterations using Curves with masks as required. A few “hot” pixels were removed with the CloneStamp tool. Image scale is 1.1 arcsec per pixel for this camera / telescope combination. Ron, that is one of the most beautiful picture that we have ever seen. FANTASTIC. If you make prints I would like to purchase one. I have showed it to a few people and they loved it. Thanks! Yes, my images are for sale. I need to finish it first though! ;-). I will let you know when it is ready. What an amazing shot Ron! When I first started observing with an SC-8 this galaxy was my nemesis. I had no idea what to look for…just that the guide books said it had high luminosity. Night after night I searched the appropriate sky, often using high magnification. You know what I was doing…looking right through it. …Looking at the leaves and missing the forest! Colours and details are wonderful. Keep up the great work. Saw this great image on the ASA forum. It would perhaps be instructive to process, say, 10 hours worth, and see what the difference is. I am currently also using ASA10N with all the focal ratio options, but the farthest I’ve gone at f/6.8 is 5 hours 20 min with X2 binning for a scale of 1.3″/px. I aim for an image scale around 1 arcsec/pixel, so f/6.8 works great for me with my camera, which has 9 micron pixels. Your image scale of 1.3”/pixel is very good. If you think it is under sampled for your seeing, consider using PixInsight’s new Drizzle combination process to improve resolution (and your image scale). You could also shoot unbind, which would give you around 0.65″/px – excellent if you often have good seeing.